Now that I had Meedio working fairly well I turned my attention to the TV PVR function. Ultimately I wanted my PC to run everything going to my TV including TV itself. I ordered a Hauppauge PVR 500 dual tuner card, installed it and tested it with Hauppauge’s software. All worked well so it was time to try out some of the PC PVR programs out there. 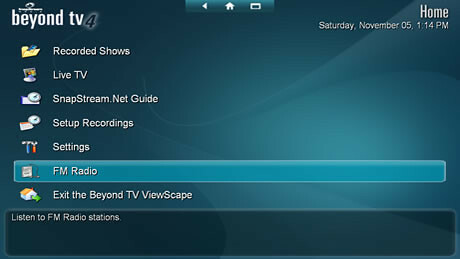 Others on the meedio forums were mostly using BTV or SAGE for their TV/PVR software and starting the TV program from meedio. I first downloaded the trial of SageTV. I spent several days setting it up. With the help of posts on the forum I finally got everything set up. It worked well. Things I didn’t like about it was the fast forward wasn’t a true fast forward – it was sort of a skip forward and not smooth. The look wasn’t as polished as I would like, but it was o.k. Still, it worked and seemed like it could be what I was looking for. I started trying out some of the add-ons available. Again these were a lot of work to set up. Commercial skipping was one that I wanted and once I got it working it was very nice. Next I tried Snapstream’s Beyond TV trial. My first impression was very good. The menu screens were clean and easy to read. Everything I tried worked without a lot of setup. The setup process for me was perfect. I tweaked was the recording settings to use up less disk space I used a slightly lower quality setting. I also added two minutes padding – this means if I set up BTV to record a show that starts at 7pm and ends at 8pm, the recorder will start 2 minutes before 7pm and end 2 minutes after 8pm. This is done to prevent loosing part of a show when the networks mess with the timing of shows. Other than that I didn’t have to tweak anything else. It automatically detects commercials and marks them so that when you watch a recorded show and come to a commercial, you just hit the channel up button on your remote and it goes to the end of the commercial. Sage had a similar capability, but it required an add-on and additional set up. After trying out Snapstream for a few weeks I was sure that BTV was the right one for me. To the left is a creenshot of the BTV Guide. The Red Dots denote shows to be recorded. I think it’s a good idea for anyone thinking of purchasing one of these programs to try both out to see which one is best for them. You can also find out much information on the Snapstream forum, SageTV forum, HTPCNews, and BYOPVR. Just keep in mind that we HTPC users are a biased bunch so our opinion is likely slanted one way or another. I truly believe that it is best to try out both before you buy. While you’re at it try out the free, open-source options also. They are pretty good and constantly improving. My goal was an easy setup and good WAF (wife acceptance factor). This is why I chose BTV for my PVR. Once I decided on BTV, I set up meedio to launch BTV as the default PVR/TV program. I then sprung it on the wife & kid. Both seemed to figure out the functions of BTV quickly. The main feature they both liked was the commercial skip. They still to this day complement that feature when watching TV.